Lauren Beougher visited her hero Sunday. When Beougher, 24, rolled down State Route 80 in east Fort Myers, sliding around the curves of Lee Memorial Cemetery, her heart wasn’t the only thing hurting. She felt it all over. Her love for the man she lost swelled to the point of feeling ill when she saw his gravestone for the first time. “I felt sick to my stomach when I left,” Beougher said. It had been five months since the Dec. 8 hit-and-run accident that seriously injured her and ended the life of her husband, Sgt. 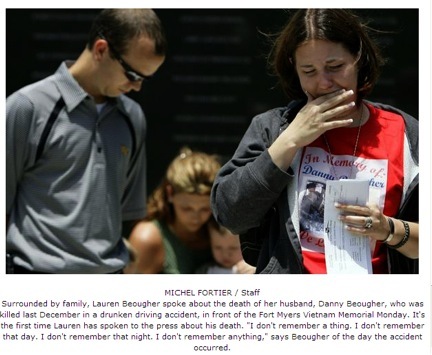 Daniel Beougher, 23, an Army veteran who served three tours in the Middle East. He received 11 awards and medals, including a Purple Heart, and was returning home to visit friends and family for Christmas. But as the couple crossed Hancock Bridge Parkway in North Fort Myers, they were struck head-on. On Monday, Beougher made her first public appearance since the crash. Her statement began with a host of thank yous to those in the community who have supported her, to her family and friends and to the law enforcement officers and prosecutors who put Ashley East, 25, of Cape Coral, behind bars. East has been charged with 10 counts relating to the accident, including five counts of leaving the scene of a crash, three counts of driving under the influence and two counts of driving without a license. East was arrested Jan. 18 after stepping off a Greyhound bus in New Jersey, where authorities said she fled. If convicted on all charges, prosecutors say she faces between 14 years and 50 years in prison. “I do not want to make any comments about Ashley East beyond sincere hope that she pays for the death of my husband and the devastation that she has caused for all involved,” Beougher said as tear after tear streamed down her face. A dozen family members stood behind her in front of the Vietnam Veterans Memorial at the foot of the Midpoint Bridge in Fort Myers. Beougher was presented with a $1,900 check from disabled Vietnam Veteran Ken Patton. The money was raised at a recent pig roast organized by Patton’s fellow veterans. “Things like this really touch me, because you know it’s a tragedy that you have to meet someone this way,” Patton said. Beougher wore a shirt bearing “In memory of Danny Beougher,” with a picture of him and “We Love You!” below it. Around her neck hung a dog tag photo frame, a picture of the couple embracing inside. Beougher said she remembers nothing of the night of the accident, nor the months before it. “I don’t remember a thing. I don’t remember that day, I don’t remember that night, I don’t remember that whole week,” Beougher said. “As to the weeks when he came home from Iraq, I really don’t remember. I don’t remember. I wish I could, but I can’t.” She said her husband’s items are kept close. Pictures adorn the walls of her home. She stays close with the couple’s friends. To fill the emotional hole caused by her loss, Beougher said she has taken up the cause of preventing similar accidents from happening. She plans to speak to high schools, and perhaps even write a book. Last week in Tallahassee, the State Senate passed a bill calling for stiffer penalties for those who lend their vehicles to unlicensed drivers. The truck East was allegedly driving belonged to someone else. Following her husband’s death, Beougher was unable to attend his funeral. She said it was because of the emotional distress she was going through at the time. Beougher said she couldn’t remember any experiences that would have finalized the death of her husband in her mind. On Sunday, she said it all changed.